Mooncrest Neighborhood Programs, operated by the Felician Sisters of North America, focuses on actively revitalizing a 395-unit complex, home to nearly 700 people in Moon Township, near Pittsburgh. The After-School Program provides an environment that is non-denominational and faith-based, safe, comfortable, and secure away from home; where students learn, share, and respect themselves and others, enhance a good self-image, develop mentally, socially, emotionally, spiritually, physically, and have fun besides. The program operates daily throughout the school year allowing children to complete their homework, develop social skills, improve study habits, enjoy experiences with arts and crafts, drama, music, technology, and interact in play. The Community Center provides ample outdoor space for organized play including a basketball court, deck area, swing set and additional equipment. Included are monthly field trips to various venues such as sporting events and activities at nearby Robert Morris University, swimming at the Sewickley YMCA, theater performances at Our Lady of Sacred Heart High School, horseback riding, hay rides and fishing at Youthtowne. These outings provide learning experiences for children whom may not otherwise have the opportunity in which to participate. These experiences carry over to the school classroom and enable the children to discuss and write about these special trips. The After School Program is also home to a literacy program for grades 1 to 3 to strengthen reading skills, a Life Skills program focusing on emotionally, physically and spiritually healthy life choices for students in grades 3 and up and the Mooncrest Community Garden nutrition and fitness program. The Helper Program encourages students in Grades 6-8 to stay connected to the Mooncrest Ministry. Middle School Helpers are able to get help with their own homework and spend time helping the lower grade students with homework. As a high school student, they can continue to gain valuable work experience by volunteering at the After School Program and then consider combining part time employment with local college attendance once they graduate from high school. The staff for this program includes Felician Sisters, lay personnel and volunteers from Moon High School and Our Lady of the Sacred Heart High School and local Churches. Other volunteers include student-teachers from Robert Morris University, retired teachers, engineers and doctors, and residents from the Mooncrest neighborhood. The Summer program is a follow-up to the Mooncrest After-School Program. Throughout the summer, the children attend various camps. These include several days at Youthtowne, where they participate in fishing, horseback riding, go-carting, organized games, arts and crafts, and nature walks. Camp at Gilmary Center offers various outdoor sports. 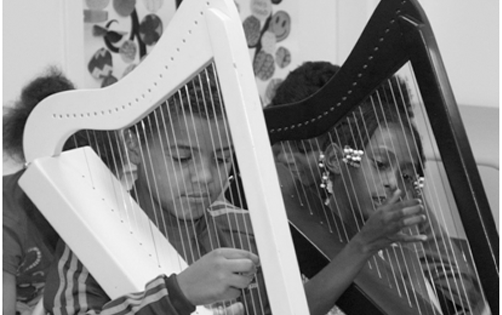 Summer also includes Art Camp, presented by Sweetwater Center for the Arts, and Music Camp, where students work with professional musicians to learn drums, harps, vocals and performance skills. Music Camp concludes with a concert open to the community. Summer Garden Camp gives children an opportunity to explore and respect nature and provides the added benefit of nutritious home grown vegetables to take home and share with families. All camps include lessons in team building, respect and kindness as well as having fun! Free USDA summer lunch is available weekdays at Mooncrest Neighborhood Center for children through age 18. The lunch program is sponsored in part by this Mooncrest Felician Ministry and Moon Township Police Department. After lunch children have an opportunity to read to staff and volunteers and earn points for prizes in the Moon Township sponsored summer reading program. A Pasta Dinner, prepared by the Felician Sisters, is provided to the Mooncrest Neighborhood, fall through spring on the last Wednesday of the month. We joyfully serve between 80-120 children and adults from 5:30 p.m. until 7:00 p.m. Take out also available. Each Wednesday morning, at 10:30, residents of Moon Township gather for a fun game of Pokeno. This Social has been a success since its inception bringing a neighborhood together. Prizes awarded are paper products not received at the Food Bank. SHARING FAITH At 10:00 a.m. on Wednesday mornings, before Pokeno, residents can join Felician Sisters for coffee and faith based discussion. SANDWICH and COFEE with SISTER RENE: On the third Wednesday of the Month, immediately following POKENO, Sister Rene hosts a lunch meeting to provide residents with an opportunity to discuss community affairs. Speakers are invited each month based on requests by the residents. WOMEN’S GROUP on Wednesdays after Pokeno gives women a chance to share personal concerns in a supportive environment, with discussions facilitated by a Felician Sister and a community volunteer from a local Church. GED adults are able to complete their high school education at the Mooncrest Neighborhood Center through a partnership with Greater Pittsburgh Literacy Council’s GED program. Click here to donate to our programs.